After handling hundreds of cases, we have learned that a bike crash is rarely a "bike accident." As a Maryland bike crash attorney, Peter knows the difference. He has represented cyclists in Annapolis, Bethesda, Columbia, Baltimore, Rockville, College Park and other towns across the state. 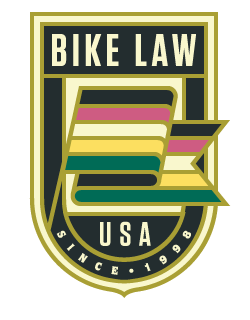 Display your support of Bike Law by adding our badge to your site. Click the badge you want, copy the html, and paste. In 1998, Peter had a bike tragedy in his own family, realized first hand the need for lawyers who understand cycling, and devoted his law practice to Bike Law. From the start, calls and referrals have come from friends in cycling clubs and bike shops and from advocates for better bicycling. Since then, Peter has represented Maryland cyclists who have been injured by motorists, unsafe road conditions, or defective cycling products. Raised in Bethesda, Peter represents cyclists throughout the State, from the D.C. suburbs to Annapolis, Columbia, Baltimore, Frederick, Cumberland and everywhere else. After many years of using the phrase "bicycle accident," Peter and Bike Law officially "dropped the A word" and began using the term "bicycle crash." After many years of handing bike cases, we realized that bicycle crashes are not bicycle accidents, because they are not accidental. Here's why. Peter is a Life Member of the League of American Bicyclists and is a League Certified Bicycle Safety Instructor (#1864). He is rated as an AV Preeminent Attorney, and has received awards for his pro bono work from the South Carolina and American bar associations and the Washington Lawyers Committee. Peter speaks across Maryland (and country) to bicycle clubs, advocacy groups, and law enforcement personnel on bicycle safety and bicycle laws. He is especially interested in the etiquette and culture of cycling, and his article “The Lost Art of the Group Ride” has been downloaded over 75,000 times. Click here for more about his bicycle-only law firm. For DC area cyclists, there are Bike Law lawyers in DC and Virginia as well. If you have been injured in a Maryland bike crash, by a defective bicycle product, or because of an unsafe road condition and would like to discuss your case with a Maryland bicycle crash attorney who gets cycling, Peter welcomes your call for a free consultation. He can be reached at [email protected] and 844-531-7530. Please be advised that this website is for the purpose of legal advertising and marketing. If you would like Bike Law to come speak to your club or at your shop, please contact us.